NEW YORK -- Martin Shkreli, the former hedge fund manager vilified for buying a pharmaceutical company and jacking up the price of a life-saving drug more than fiftyfold, was arrested Thursday for running companies unrelated to the furor "like a Ponzi scheme," authorities said. Who is Turing Pharmaceuticals' Martin Shkreli? U.S. Attorney Robert Capers told reporters that Shkreli weaved an "outrageous web of lies and deceit" to make the scheme work. The boyish-looking 32-year-old entrepreneur - a relentlessly self-promoting figure who has called himself "the world's most eligible bachelor" on Twitter and recently plunged into the hip-hop world by buying an unreleased album by the Wu-Tang Clan - was taken into custody in a gray hoodie and pleaded not guilty in federal court in Brooklyn. He was released on $5 million bail. Online, many people were gleeful over in his arrest, some of them joking about a judge ratcheting up his bail or lawyers jacking up their hourly fees 5,000 percent for defending him in his hour of need. He left court without saying anything to reporters. A spokesman for Shkreli said the pharmaceutical company executive denies the securities fraud charges he's facing and "expects to be fully vindicated." "It is no coincidence that these charges, the result of investigations which have been languishing for considerable time, have been filed at the same time of Shkreli's high-profile, controversial and yet unrelated activities," spokesman Craig Stevens said late Thursday. 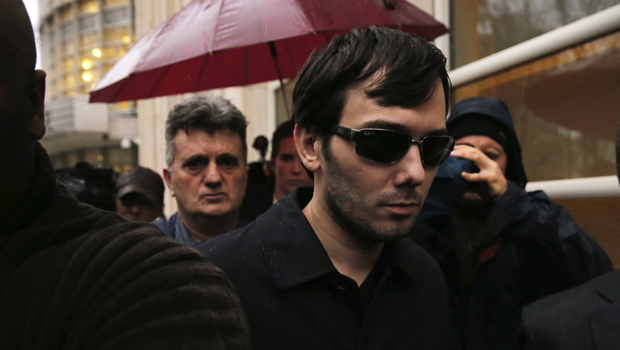 Shkreli was charged in an indictment unconnected to the drug price hikes imposed by his company Turing Pharmaceuticals. The charges instead involve his actions at another pharmaceutical company, Retrophin, which he ran as CEO up until last year. Prosecutors said that in a "Ponzi-like scheme" between 2009 and 2014, Shkreli lost hedge fund investors' money through bad trades, then raided Retrophin for $11 million in cash and stock to pay back his disgruntled clients. A Retrophin spokesperson said in a statement Thursday that the company's directors replaced Shkreli more than a year ago "because of serious concerns about his conduct" and conducted an independent investigation into his actions. The spokesperson said Retrophin was cooperating with the government. Shkreli was charged with securities fraud and conspiracy. A second defendant, lawyer Evan Greebel, of Scarsdale, New York, was charged with conspiracy and also pleaded not guilty. The Brooklyn-born Shkreli has found himself at the center of a firestorm over drug pricing in the last few months, and he hasn't been afraid to throw on more fuel. It began after Turing Pharmaceuticals spent $55 million in August for the U.S. rights to sell Daraprim, a 62-year-old drug for a rare parasitic infection, and promptly raised the price from $13.50 to $750 per pill. The move sparked outrage that resounded from the presidential campaign to the punk rock world and turned him into the new face of corporate greed. Headlines called him such things as "America's most hated man," the "drug industry's villain," ''biotech's bad boy" - and those were just the more printable names. Hillary Clinton called it price-gouging and said the company's behavior was "outrageous." Donald Trump called Shkreli "a spoiled brat." Bernie Sanders returned a donation from Shkreli. And indie record label Collect Records said it was severing ties with Shkreli, who had been an investor. Shkreli has said that insurance and other programs allow patients to get the drug despite the cost and that the profits are helping fund research into new treatments. But he has also unapologetically made a business-is-business argument for the price jump. In fact, he recently said he probably should have raised it more. The Campaign for Accountability, a nonprofit watchdog group that urged Congress to investigate Shkreli's price increases, called his arrest "long overdue" and added: "He has avoided accountability despite a pattern of fraudulent behavior." Shkreli is known as a prolific user of Twitter and often livestreams his work day over the Internet, the camera showing him at his desk as he does business, kills time on the Web and invites people to chat with him. He refers to those who follow him online as his "fans." Recently it emerged that he bought the only copy of a Wu-Tang Clan album titled "Once Upon a Time in Shaolin," which the group sold on the condition that it not be released publicly. He said he paid $2 million. The FBI tweeted about the album late Thursday. #Breaking no seizure warrant at the arrest of Martin Shkreli today, which means we didn't seize the Wu-Tang Clan album. Last month, Shkreli was named chairman and CEO of KaloBios Pharmaceuticals, a struggling cancer drug developer. After his arrest, its stock fell by more than half Thursday before trading in the company was suspended.